Ever since I was a little girl in primary, I have always wanted to go on a mission. 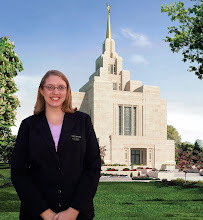 When singing the song, “I hope they call me on a Mission…” I never thought that as a girl, I wasn’t expected to go on a mission; I thought everyone did and I had the desire. In later years, I watched the video, “Called to Serve” and was in tears when all the missionaries sang that song in all their different languages. I had the spirit testify to me that I would serve a mission. When I reached the age of 21, I was in Florida working for Walt Disney World. There I spent more money than I made, but was determined to go home and work towards my mission. By the time I turned 22, I was ready and I couldn’t turn in my papers fast enough. All of the doctor’s appointments seemed never ending! I finally had my papers submitted November 24th and received my call on December 12th. That day I had my family and some friends come watch me open the papers. I had no idea what to expect, but when I read Ukraine Kyiv I was in total shock. I think that if I had not had so many people over and watching my reaction, I would have had a panic attack. I guess in the back of my mind I thought I would end up serving somewhere in the Midwest US. Ukraine sounded soo foreign and I knew absolutely nothing about it. After doing some research and talking to some people who have been there and loved it, I am feeling more comfortable, but I don’t think that my shock will settle down all the way until I’m about half-way through my mission. What I am most excited for is the new Temple that will be completed in Kiev while I am on my mission. I can’t imagine the missionary opportunities that it will bring!